I get a lot of questions on this little Blogcito about my Master’s Program…so I’d like to tell you about it and all the reasons I loved it! We should be clear: this is a totally unbiased review. I didn’t get paid to write this and no one asked me to endorse the program. However, this is not a totally selfless recommendation: Anne Connor, if you’re reading this, I am still serious about wanting to teach a Pedagogy course in GTO. Just give me the word and I’m THERE!! Every summer, Summer Language Institute offers 2 three week sessions in Guanajuato. It takes 5 sessions to earn the Master’s Degree but you can arrange the sessions however you want. I did it straight through in 2.5 summers but it’s up to you! There are core classes- Second Language Acquisition Theory, Assessment, Teaching for Proficiency and Action Research- which are taught in English. Especially for people like us, teachers who are interested in loading up the Little Darlings with Comprehensible Input, the courses are awesome! I was a CI teacher before I did my masters but it really gave me a good foundation of Language Acquisition research and the reasons we do what we do. Then there are electives classes that are paired with pedagogy classes. So, for example, you might take Mexican Cinema as an elective, paired with Teaching with Film or Bilingualism in the United States paired with Teaching Heritage Students or Mexican Literature during the 19th century paired with Reading Strategies for the classroom. The elective/ pedagogy classeschange every session and are taught in Spanish. Guanajuato is so quintessentially Mexican! It’s a colonial city in the mountains of Central Mexico, which is famous for it’s tunnels- the majority of the city’s traffic flows below the city- leaving the streets and alleyways void of cars and full of pedestrians. The colors are unreal, the people are warm, there’s delicious food everywhere (again, #priorities). Everything is picturesque: street musicians, parades, fireworks, fountains, churches, plazas… I can’t even begin to describe it, so I’ll leave you with a few photos. If you want to immerse yourself in Mexican culture, I can’t think of a better place to go! First of all, I got an advanced degree, which means more $$$. And since I took classes each summer, every year I moved over one step on the pay scale. In my district, each step’s pay raise was equivalent to tuition costs for the following summer! You guys, after my first summer, my degree paid for itself! And I didn’t really have to pay for the first summer either! It’s such a cool story of God’s provision: I really wanted to start my degree, and I wasn’t sure how I would pay for it- you know, being a brand new teacher and all. I was praying about it and applied, still unsure if I could afford it. Just as tuition was due that first year, our teacher’s union negotiated a sizable pay raise, and we got paid retroactively, and would you believe it? The check I got was exactly how much I needed for my first summer’s tuition payment! How’s that for an awesome story?! And perhaps the best benefit of all…you become really close with a small cohort of teachers who you study with during consecutive summers…Nearly a decade later, I still frequently communicate with my colegas. We regularly collaborate and support each other from across the US. Some have become some my dearest friends! Like the (soon to be world famous) author, Rita Barrett, for example! Did I mention I ate really well (and adventurously) in Guanajuato? I survived the homework and you will to. Just know it’s coming and it’s serious! 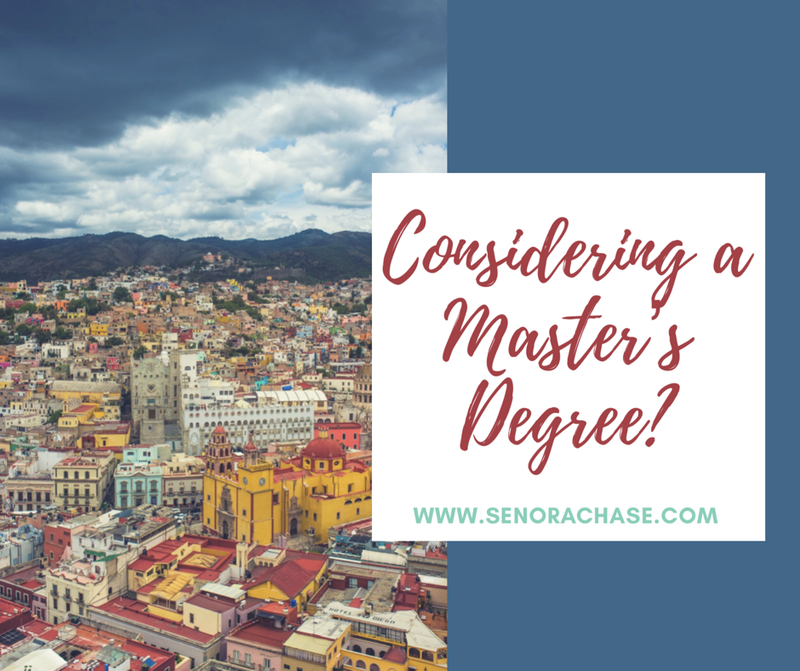 If you’ve been kicking around the idea of getting a Master’s Degree (or another one!) I highly recommend you check out Southern Oregon University’s Summer Language Institute. If you’ve got other questions, hit me up! I love that you love reading my posts! Yes! I affirm everything AnneMarie said about the SOU program. She and I met through the MoreTPRS list before we started our first summer and it was encouraging to know there would be someone else there who “got” the way I taught. We soon discovered we were “uña y mugre” and our summers in Guanajuato led to all kinds of fun collaboration. Meeting this friend was definitely worth the price of admission and we were delighted to find other classmates who were also interested in CI teaching. She is right that the program is intense, so plan to arrive early or stay late so that you can enjoy some of the sights. But the wonderful thing is that the university is situated right in the heart of historic Guanajuato, so you can´t avoid being immersed in the culture and sounds of Mexico. Guanajuato, your street music and the tolling of your bells will always be in my heart. And Anne Connor, you should absolutely have AnneMarie teach a class! And Anne Connor, if you’re still teaching, Rita Barrett will also teach a pedagogy class!! Meeting Rita might be the best and longest lasting benefit of the program! Te quiero, amiga! !